This is the second installment of a two-part series on ISO 55000, IIoT and EAM. Find Part I here. ISO 55000 provides a foundation for effective asset management. Once the foundation has been laid, it’s time to become more efficient and bring in information systems that collect, monitor, store, analyze, and report asset management data. An asset management operation has two layers of information technology. The upper layer is an EAM software system, which is the main repository for asset management data. The lower layer consists of IIoT devices and critical supporting applications such as SCADA, BAS, HMI, and others that connect to the EAM system to share data. Layers of an asset management operation. Data flows up from assets, while decisions flow down from management. 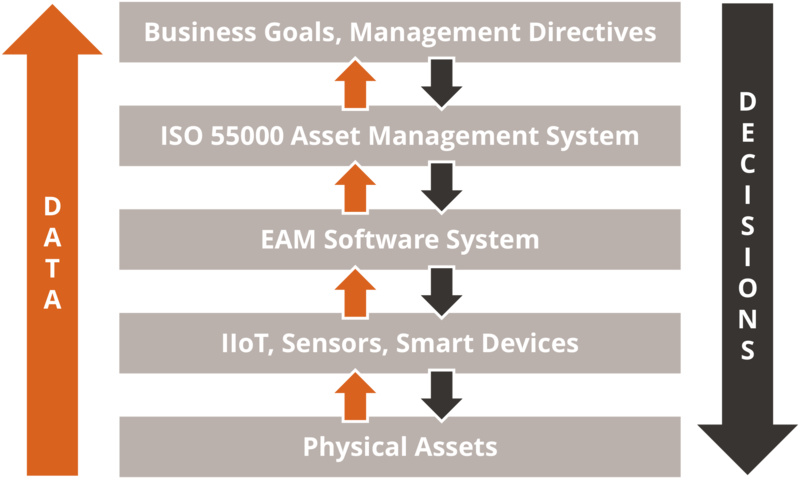 IIoT, EAM, and ISO 55000 live in between, connecting physical assets to business goals. IIoT has launched a new era of asset management—an era driven by real-time information and intelligent machines. IIoT automates data collection and condition monitoring, allowing organizations to gain deeper insights into asset performance and to respond more quickly when something goes wrong. When integrated with an existing EAM software system, IIoT can significantly increase the efficiency of an asset management operation. For example, IIoT can send performance data to the EAM system, where abnormal conditions will trigger an alert or an automatic work order. It can pass usage data to the EAM system for real-time energy and cost tracking. But IIoT and EAM technology cannot drive value creation by themselves. Smart devices will tell you when a machine is performing outside normal parameters, but they can’t tell you how to respond, who is responsible, or what procedure to follow. That kind of strategic direction is the domain of an ISO 55000 management system. At first glance, the marriage of ISO 55000 and technology looks strange. One is stable, application-agnostic, documented, and works top-down; the other is dynamic, application-specific, and works bottom-up. Steel toe meets pocket protector: not a likely couple. However, as with the Odd Couple, opposites attract. And once together, the whole becomes greater than the sum of the parts. ISO 55000 asset management systems and technology systems perform different but complementary functions. Management systems bring the process; technology systems bring the tool set to execute it. When you put the puzzle pieces together, something magical happens and value is created. 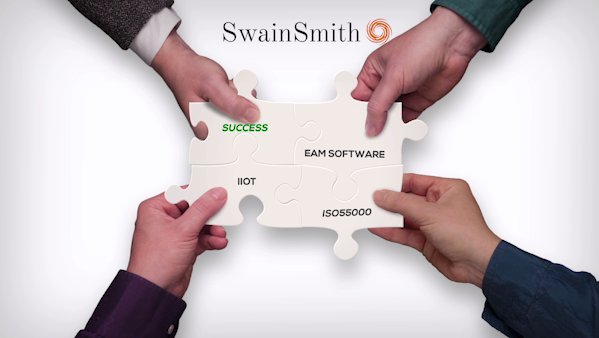 Together, ISO 55000, IIoT, and EAM software make asset management success possible. Which comes first: ISO 55000, or IIoT and EAM technology? IIoT devices and EAM software must be configured to support practices—not the other way around. Too often, an organization’s business process will be designed around what the technology can or can’t do. Tying your practices to IIoT or EAM functionality creates technology tunnel vision, preventing you from designing optimal practices based on the organization’s objectives. Remember, technology is only as good as the process driving it. Value creation begins with an ISO 55000 approach. 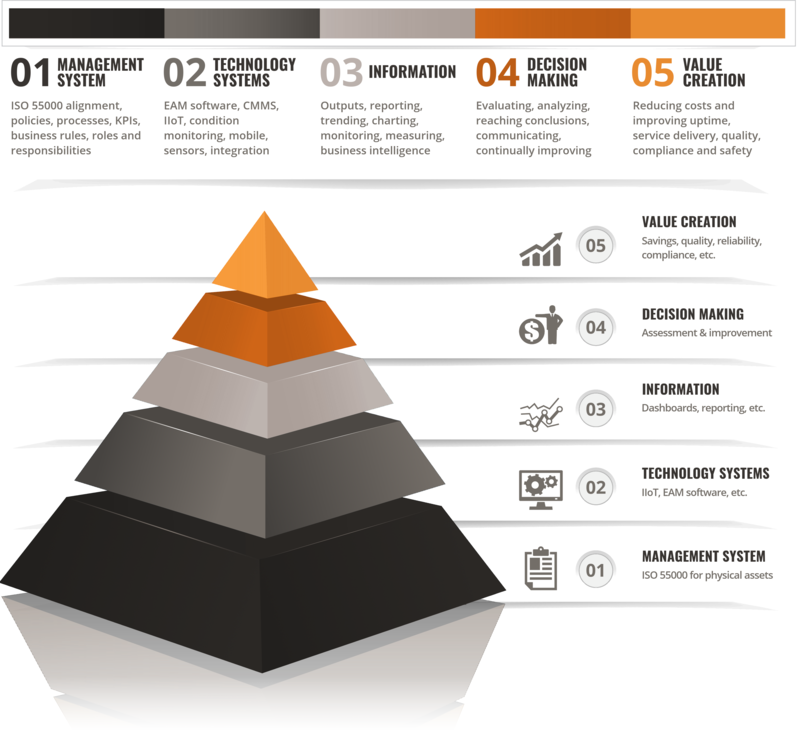 As the pyramid chart illustrates, management systems are foundational to creating value with asset management. This is an important concept. As we discussed earlier, technology should be a product of the process, not the other way around. When technology systems get in front of management systems, you’re in for trouble. The wrong captain is driving the boat. Implementing a technology system (IIoT or EAM software) without fully defining your management system (business processes) will leave you operating without direction. Configuring software as you go is a potentially risky and very costly endeavor. The better approach is to put an ISO 55000 management system in place, then bring in technology systems to streamline it. Technology is a requirement for success—but only after you have fully defined how you are going to conduct business. Management systems make you effective, while technology systems make you efficient. Effective and efficient asset management is what we’re all after, right? Your physical assets are valuable. They deserve a formal, structured approach. And that’s exactly what ISO 55000 offers. Trying to achieve asset management success without a management system is like trying to finish a puzzle with a missing piece. Adopting an ISO 55000 approach may require a change in how your organization thinks about asset management. You may have to move from a maintenance focus to an asset management focus. You may have to apply a more comprehensive strategy—one that addresses all the variables that drive asset management, not one that focuses solely on IIoT and EAM technology. For many organizations, this will be a major paradigm shift. But the value that ISO 55000 creates is worth it. Major organizations around the world are seeing the benefits. Benefits like lower costs, better service quality, more equipment uptime, and other improvements in quality, safety, and compliance. You simply can’t achieve those kinds of improvements on a long-term, sustainable basis without a management system as your foundation.